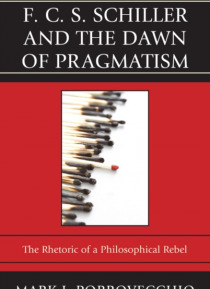 The intellectual history of pragmatism traditionally posits that its origins are found in the works of C. S. Peirce, William James, and John Dewey. What if that story is only partially true? Ferdinand Canning Scott Schiller, the foremost first generation British pragmatist, was one of the most vocal proponents of pragmatism in the late 1800s and early 1900s. He penned over a dozen books, authored … hundreds of essays and reviews, and sought to popularize the philosophy of practicalism. Yet in the years before and after his death, both he and his critics engaged in arguments that helped to erase him from the story of pragmatism. F. C. S. Schiller and the Dawn of Pragmatism: The Rhetoric of a Philosophical Rebel, by Mark J. Porrovecchio, is the first comprehensive biography of Schiller ever undertaken. It seeks to answer questions like: why were Schillers own arguments used against him? Why were his interests, philosophical and otherwise, central to his erasure? Why would the pragmatism of today gain by reclaiming a neglected figure from its past? A crucial part of understanding those questions relates to the rhetorical strategies at play in the arguments Schiller made. Pragmatism today is a vital and vibrant part of interdisciplinary discussions that range from philosophy, to religion, to science, to politics. But it is intellectually incomplete and historically inaccurate. Reclaiming Schiller means asking hard questions about the functions and scope of pragmatism. Though the answers will not suit everyone, they will help to make pragmatismpast, present, and futuremore honest, more engaging, and more interesting.